Happy Father's Day to all of the dads out there. The boyz and I are enjoying the sun and low humidity day. 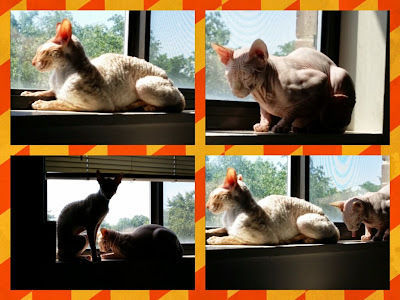 The kidz have always taken their turn sitting in the best sun spot on the ledge. Again, thinking of Maus, it is still weird not to see all of them in line, but it is comforting to see the boyz enjoying their turn in the spotlight of sun rays.